Did you know that heating and air conditioning systems tend to break down most often when the weather is the most severe? That's when your comfort systems are under the most stress. That means you are most likely to lose heat in the middle of the night during a nasty cold snap, while your air conditioner is most likely to quit in the middle of the afternoon on a sweltering summer day. Keeps your system running at peak efficiency for optimum comfort and lowest possible energy cost. Reduces the likelihood of system breakdown. Helps to identify problems before costly repairs might be needed. Helps to prolong equipment life. 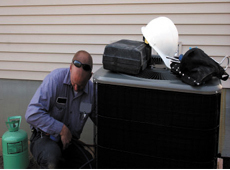 ACS Maintenance Customers receive priority scheduling ahead of our non-agreement clients. Did you know that the leading cause of failure on residential heating and air conditioning equipment is lack of maintenance?